1. Preheat the oven according to the directions on the package of crescent rolls. 2. Heat the oil in a frying pan over medium heat. Add the mushrooms, salt, and pepper and sauté until the mushrooms are soft, about 5 minutes. 3. Divide the dough for the rolls into triangles according to the package directions. 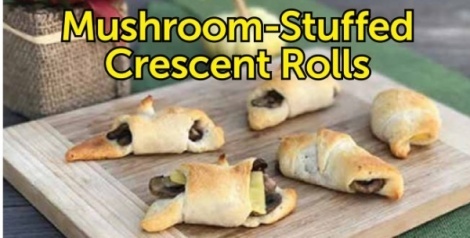 Top the wide end of each triangle with mushrooms (and cheese, if you have it), then roll the triangles into crescents. Add the rolls to a baking sheet lined with parchment paper. 4. Bake according to the package directions.